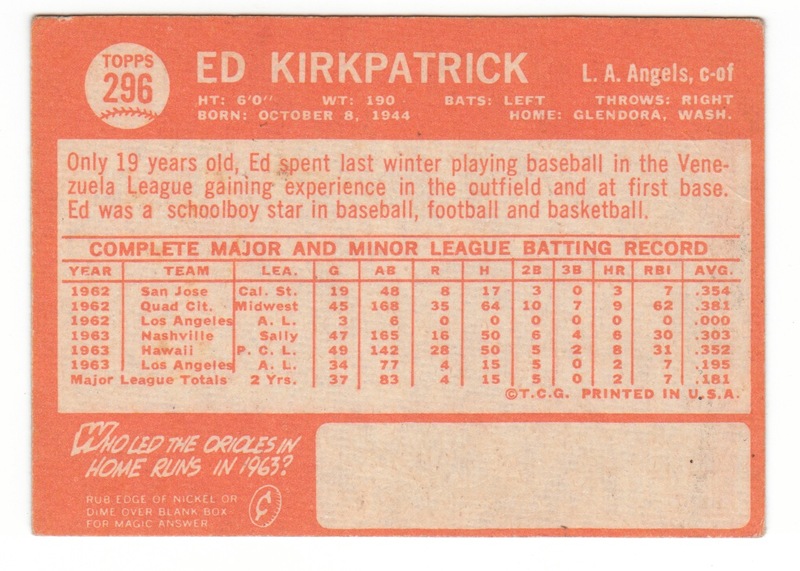 This is the first solo card for Ed Kirkpatrick. He was part of a 4-player combo rookie card in the 1963 Topps set. Kirkpatrick was just 19 years old when he appeared on this card — the 7th youngest player to appear in a game in 1964. This card is in OK shape — no better than VG-EX. The trivia question on the back asks who led the Orioles in home runs in 1963. That would, of course, be the #3 all-time home run hitter for the O’s — the one and only Boog Powell. Ed Kirkpatrick was signed by the Angels in 1962 for $20,000, and after a successful stint in the minors was called up by the end of that 1962 season. He was the youngest player to play in a game in ’62, but he got just 6 PA. He got a bit more of a chance in 1963, but ’64 was the year he finally got to play a semi-regular role with the team. He came up as a catcher, but in 1964 he played all 75 of his games in the outfield. After a ho-hum .242/.315/.356 line in ’64 with 2 homers, he spent most of 1965 back in the minors. By 1966, he was back with the Angels and earned a career-high 377 PA. Unfortunately, he didn’t use them very well, batting just .192. But he was always fairly good at walking, and managed a .313 OBP while hitting more home runs (9) than doubles (7). 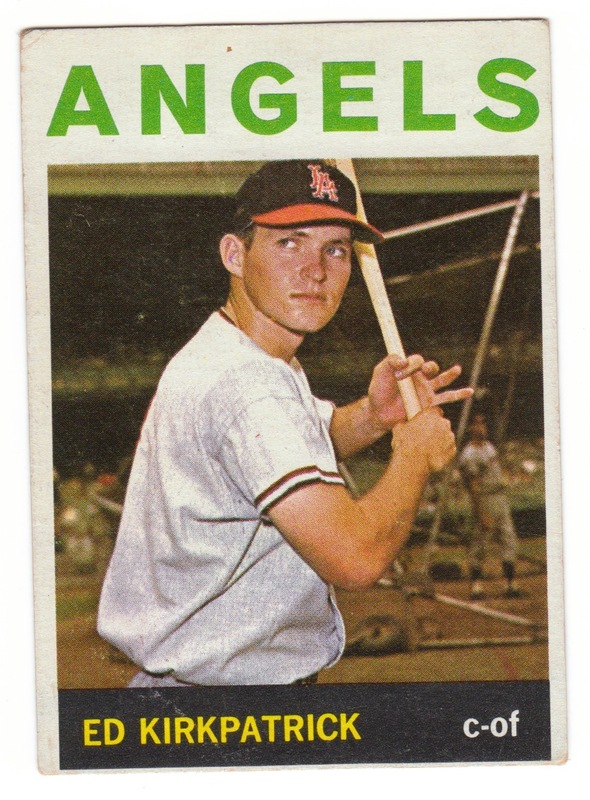 After another year in the minors, he returned for another less-then-stellar season in 1968 with the Angels. Still just 24 years old, he was traded to the expansion Kansas City Royals for eventual Hall of Famer Hoyt Wilhelm in the offseason. It was during his stint with the Royals that Kirkpatrick became a valuable MLBer. He started in left field in the first game in Royals history, and wound up with a quite decent .799 OPS (123 OPS+) in 1969, including 14 homers (he hit just 17 HR in 7 seasons with the Angels). He played every position but shortstop and pitcher that year. His averages declined in 1970, but he set new career highs with 18 HR and 62 RBI. Kirkpatrick spent three more seasons with the Royals, providing a fairly steady bat in a utility role. His 128 OPS+ in 1972 was the best of his career. After the 1973 season, he was traded to the Pirates, where he continued in a utility role. In 1974 and ’75, he made the postseason with the Pirates, but went hitless in 13 PA. When his OPS sunk to .589 in 1976 and he wasn’t getting much playing time in 1977, the Pirates traded him to Texas for Jim Fregosi in June. In August, the Rangers sent him to Milwaukee for a player to be named, which ended up being Gorman Thomas (who eventually went back to the Brewers in 1978). Kirkpatrick’s final game was October 2, 1977, with the Brewers. He returned to the Angles organization in 1978 and posted good numbers in AAA, but never made it back to the show. In parts of 16 seasons, he batted .238/.327/.363 with 85 home runs. Known as “Spanky” during his career, Kirkpatrick was out of baseball by the age 33. In 1981, he was in a car accident that led to a blood clot that put him in a coma for nearly six months. He emerged eventually, but suffered permanent paralysis. Kirkpatrick is still alive, and is now 65 years old. I thought about Ed Kirkpatrick. Just a feeling there something about him…and just now I figured it out…He played in the first MLB game I ever saw (July 1970 KC vs. Min) and he played in the first minor league game (August 1978 Salt Lake City vs. San Jose PCL). Ed was an interesting in how many times in his career he switched from catcher to outfielder and vice versa.